Much was made over the fact that Riccardo Tisci presented his Fall 2017 menswear on January 20, at the same time as Donald J Trump was at the inauguration ceremony where he was sworn in as the 45th President of the United States. It is Tisci showed at the same time Trump proclaimed a national day of patriotism and boasted his protectionist values—Tisci has long been influenced by Americana. 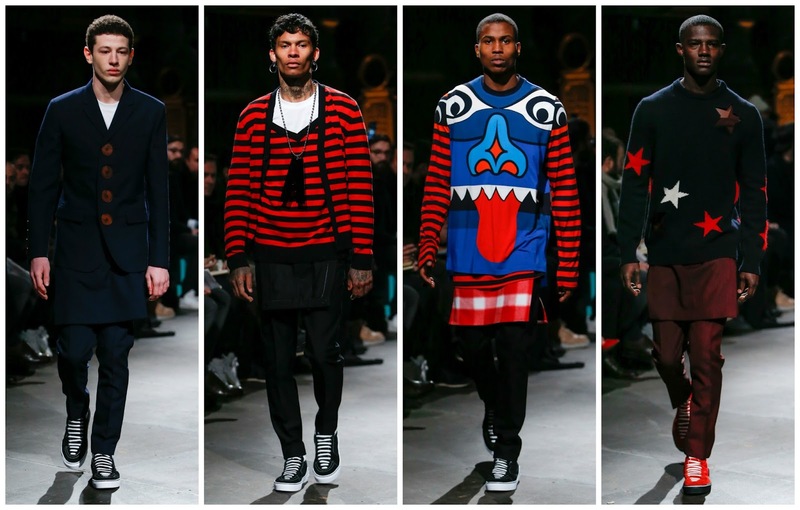 His menswear collection last June featured the dollar sign motif; his Spring 2016 womenswear was shown in New York, coinciding with the 14th anniversary of 9/11 and celebrated togetherness and American resilience; he made headlines with his “Victorian-chola girl” of Fall 2015, on the grounds of cultural appropriation cries; basketball culture underscores much of his oeuvre. To extend his reference pool, he looked at the star spangled banner and its stars and stripes. Dennis The Menace style sweaters were decorated with red and black stripes. Other sweaters were printed with a constellation of stars. They came in the rich hues that punctuated his last womenswear outing. Elsewhere, he explored Alaskan heritage and totem poles—dazed characters appeared on t-shirts and jumpers. Mining skate cultures’ endless references, those group of boys in the show resembled Tisci himself, in plaid t-shirts with Vans-esqe Givenchy trainers. 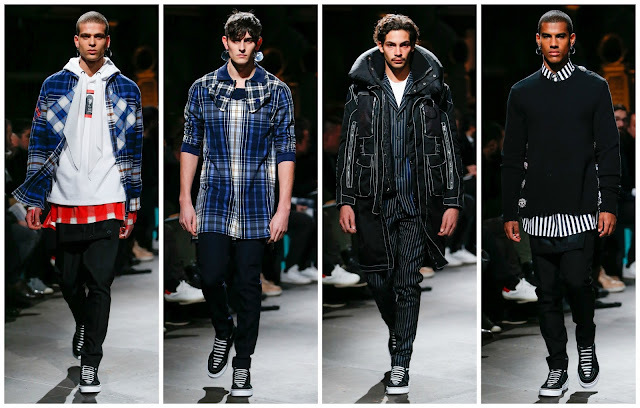 A blue plaid jacket over a white hoodie, a red top creeping out from beneath, black joggers and trainers—a look in the show—couldn’t be more in tune with men on the street. Tisci isn’t selling any false American dream; his casting and clothing are much more a reflection on the American reality: it’s diverse, a universe shared by people from all backgrounds and races and genders, and it’s comprised of sportswear, streetwear, formalwear. A pinstripe suit with an exposed-seam jacket and trainers doesn’t contradict itself in Tisci’s design language; the mix between workwear and streetwear characterises American fashion which emerged in the 20th century. The show closed with an assortment of his couture collection which nowadays is presented alongside the men’s. Commandeered by Mariacarla Boscono, Tisci’s women were inspired the “Victorian women of the west”. Similar to Erdem’s Spring 2016 collection, the women he’s referencing are the ones who grew unhinged in their barren surroundings. Tartan and Victorian decoration lit up this part of the show. While it was on a fundamentally different level to the men’s, it wasn’t incongruous alongside as I usually find it to be. 5pm on Friday evening signalled a seismic shift to come in the world. Tisci’s message of diversity, striving for positivity even in darkness, and his passion made it bearable. He knows how to pull at heartstrings and tap into a more emotional state of being—few designers have that effect.